Eighty-seven years ago today, Charles Lindbergh, age 25, landed his plane, the Spirit of St. Louis, in Paris, 33 and 1/2 hours after taking off from New York City–the first nonstop, solo flight across the Atlantic. A few weeks later, Lindbergh–now the world’s most famous man, hero to adoring millions– moved into the Long Island mansion of aviation enthusiast Harry Guggenheim in order to have the privacy and focus that would allow him to write a book about his feat. The move was something of a last-minute decision. A manuscript for the book, which would eventually be called simply “We” (always written with the quote marks), had actually already been produced, start to finish, by a ghostwriter, New York Times reporter Carlyle MacDonald (sometimes spelled Carlisle) who had accompanied the aviator on his trip back from Paris to America on a specially dispatched American destroyer. 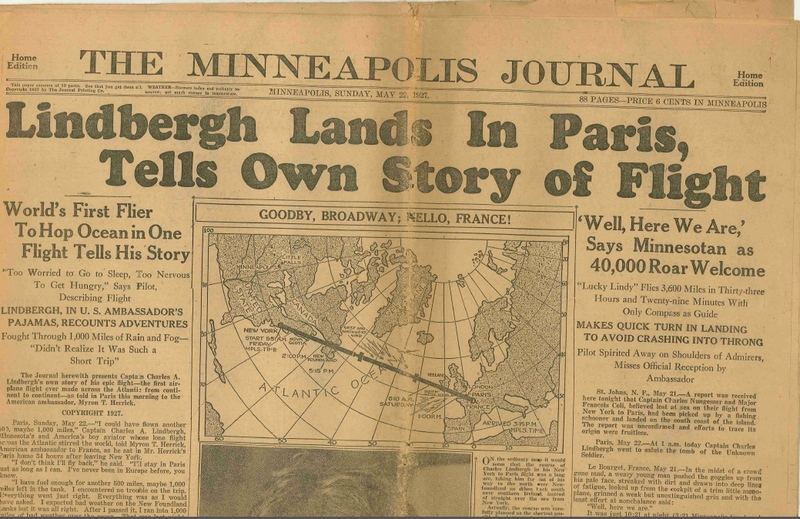 “Lindbergh” (almost surely all MacDonald) had been by-lining daily stories starting just a few days after the landing in Paris. For the man who was responsible for bringing out the book, publisher George Palmer Putnam (who would later become the spouse of aviatrix Amelia Earhart), the surest solution to his problem was to continue the relationship with MacDonald. Lindbergh was handed–not a manuscript, but the entire book set in galleys, and was expected to sign off on it. After going over it for a few days, he got exasperated and rejected the whole idea, and pledged to deliver his own manuscript on a tight deadline. The cramming session at “Falaise” (the Guggenheims’ French medieval-style “cottage”) was concocted. 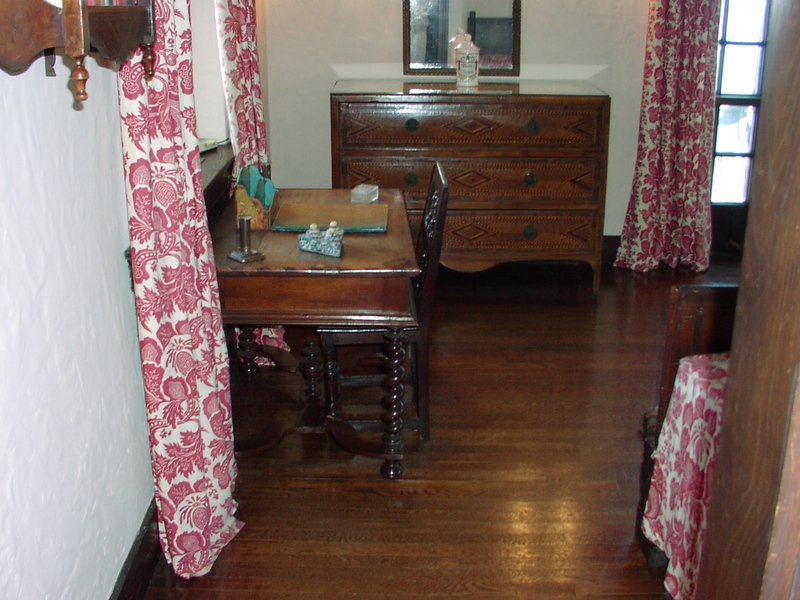 The photo here is of the relatively tiny room where Lindbergh holed up and wrote “We,” all day, every day, for just about three weeks. Lindbergh’s manuscript, along with the ghostwriter’s galleys, are in the collections of the Missouri Historical Society. No, it’s not as far-fetched a connection as you might think. I’m watching the great 1962 David Lean movie at this moment on TCM–an homage to the recently departed Peter O’Toole, of course–and I am reminded that that was not the first time that the Lawrence Legend had dominated American popular culture. 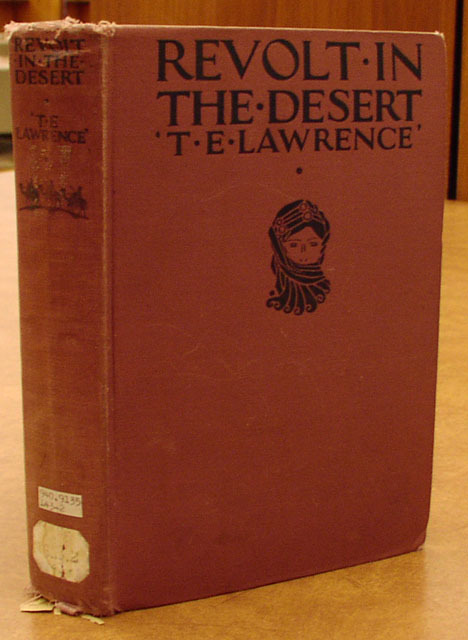 In the fall of 1927, T. E. Lawrence’s thrilling Revolt in the Desert was going head-to-head with Lindbergh’s “We” on the U.S. non-fiction bestseller lists. Revolt was an abridged version of Lawrence’s massive Seven Pillars of Wisdom, published in England in 1922–a book more known about than actually read by anyone. Publishing Revolt was a brilliant marketing stroke–a lean, exciting narrative of manly Western adventure in an exotic land, a book that brought Lawrence worldwide fame. In fact, of the top 10 bestsellers in the non-fiction category in October 1927, most of them were biographical or autobiographical, and several were–like Lindbergh’s and Lawrence’s books–tales of heroic, questing adventure, including two by the perennially popular Richard Halliburton (This Glorious Adventure and The Royal Road to Romance) and Emil Ludwig’s epic biography of Napoleon. That title up there: “Lindbergh Kidnapping Musical.” When I’ve told people that the History Theatre in St. Paul was mounting a production of Baby Case and that it was a musical about the kidnapping and the trial, I was greeted with a lot of skepticism. “A musical?” Well, yes, a musical play (note: I don’t say “musical comedy”). 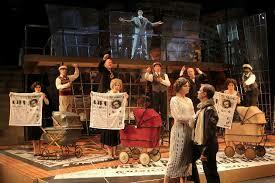 If your image of “the American musical” is something frothy and giddy and funny and lightweight, then…. think again. And the more you think about it, the more you can come up with musicals with dark themes about difficult subjects. 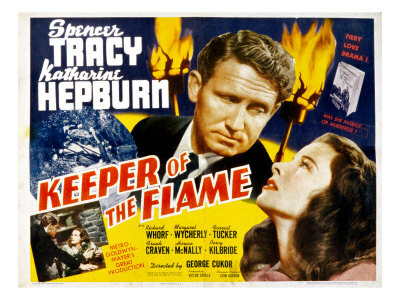 This includes classic works such as West Side Story (gang violence, teenage death); Sweeny Todd (murderous revenge); South Pacific (racism and World War II); as well as more recent works such as Parade (the Leo Frank lynching in the South); Floyd Collins (tragic spelunker, media circus); not to mention blockbusters like Les Miserables and Miss Saigon and Phantom of the Opera. Even Showboat— the grandpappy of American “book” musicals (shows that are story-driven, rather than silly musical revues) — deals with racism and miscegenation, and that show was written in 1927. Michael Ogborn was inspired to write about the Lindbergh baby case sometime in the 1980s, when he happened to catch a episode of the Phil Donahue Show, of all things. Among Phil’s guests that day were Anna Hauptmann, the widow of Bruno Richard Hauptmann, who had been executed in 1936 for the crime of kidnapping and murdering Charles Lindbergh, Jr., four years earlier. Also on the show was Ludovic Kennedy, the author of The Airman and the Carpenter–a sensational “expose” of the Lindbergh case, in which he argued for Hauptmann’s innocence and the probable involvement of Lindbergh himself in the crime. More than 10 years later, Ogborn got back to the idea of writing a play, and the result was Baby Case, which received its first production at Philadelphia’s Arden Theater in 2001. The show focuses on the media circus that engulfed Charles Lindbergh from his first moments after landing in Paris in the Spirit of St. Louis in 1927, and then even more overwhelming with his marriage to Anne Morrow in 1929, followed by the birth of their first child in 1930. All of that is compressed into a thrilling opening number–“American Hero”– that introduces the theme of popular adulation that gets out of hand, inflated and overheated by the American press. The show moves swiftly–propelled by the major-domo character of Walter Winchell, the enormous radio news star of the age, and by newspaperman William Randolph Hearst, voracious for news to feed to sensation-seeking, tabloid-reading public– through the kidnapping, the few weeks of manhunt and ransom-paying, the discovery of the child’s dead body in May 1932, and ending the first act with the arrest of Hauptmann. The second act deals with the trial and the tragic and ridiculous media circus that the trial became. The show ends with the electric-chair execution of Hauptmann (which even reproduces the double jolt required to kill him). The show proceeds at breakneck speed, piling up the relentless, grotesque and at times embarrassingly hilarious events of the “LKC” (Lindbergh Kidnapping Case, in the shorthand of “LKC” buffs). An article in today’s Times details the continuing search for answers to one of aviation’s most persistent mysteries: What happened to “L’Oiseau Blanc”? The “White Bird,” piloted by the dashing French flying ace Charles Nungesser and his one-eyed partner François Coli, disappeared somewhere over the Atlantic–or maybe in Maine, or maybe off an island near Newfoundland–around May 8 or 9, 1927. 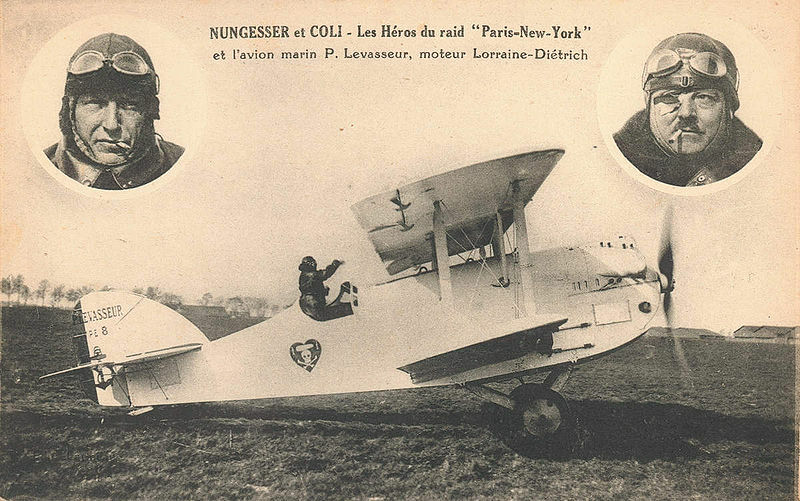 The aviators–both were already national heroes in France for their death-defying heroics during World War I–took off May 8 from Paris en route to New York City, in a daring bid to win the Orteig Prize. The prize– $25,000– was to be awarded to the first team or individual to pilot a plane nonstop from New York to Paris, or in the other direction. After takeoff the pilots jettisoned the landing gear and wheels to save weight on their single-engine biplane. They intended to bring the the somewhat bulbous plane down–gently–in the waters next to New York’s Statue of Liberty. For a brief moment, the names “Nungesser and Coli” (I wonder how people pronounced them) were on every American’s lips. (The guys were older and a good deal more glamorous than the wholesome All-American Boy, Charles Lindbergh. Check out the postcard of the pair with their dangling cigarettes and Coli’s rakish eye-patch.) The Frenchmen had stolen the lead for the Prize from the other announced contestants, including polar explorer Admiral Richard E. Byrd, as well as Lindbergh, the young “Flying Fool,” who was cooling his heels in New York, waiting for the right moment to make his “hop” from New York to Paris. When Lindbergh finally found his moment, on May 20, 1927, the French aviators had been missing for nearly two weeks. Everyone, including Lindbergh, kept up a brave face about the fliers, saying things like they were praying for their safe return. Having made it to Paris on May 21, Lindbergh even made a condolence visit to Nungesser’s aged mother. But soon all hope was abandoned. Many theories have been advanced over the years about their fate, and the latest focus is on a tiny island (still part of France, oddly enough) off the coast of Newfoundland, where some evidence points to a Nungesser-Coli catastrophe nearby.